To her husband these words conveyed a feeling of annoyance, as if the matter was not really settled. 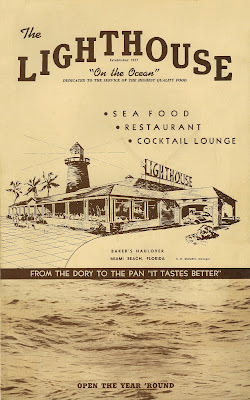 Each year on their anniversary, as if drawn by some need, they returned to The Lighthouse, where they recounted over dinner the joys and sorrows of their marriage. Feelings of irritation turned to anger, as he brooded over her remoteness. Had there been a gun handy, or a bat, who knows what might have happened next, such were the extremes of his emotions at moments like this. “Then it’s settled. But wait, you’ll see; it won’t be crowded,” Len said, as he poured himself a Scotch. “Yes, it will be fine,” she called back, not knowing he had slipped out of earshot, having stepped out into the backyard to breathe in the balmy night air. When they arrived the next evening, the manager greeted them as if they were old friends. Restaurants are curious places, Ginny thought, as they made their way through the bustling dining room. Where do all these snowbirds come from? Ginny and Len had not always been as well off as the tourists who flocked to this seafood restaurant on a palm-fringed inlet in Miami Beach. For them, it was only a twenty-minute drive across the bridges that traversed the intracoastal waterways north of Biscayne Bay. And yet, there had been some years when it was a wonder that they had made it here at all. Len ordered a whiskey sour for her; a medium dry vodka martini for himself. “Shaken, not stirred,” he joked, flirting with the waitress. 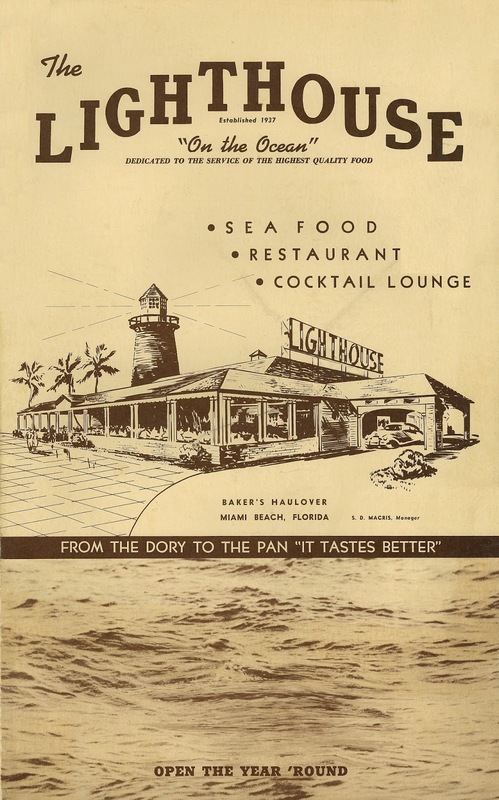 What he and Ginny needed was a real Florida honeymoon, just the ticket for their twenty-third year, he thought, as they opened the large menus. The prospect of an ordinary dinner suddenly put him in a pensive mood. Like a mediocre work of art, everyday food depressed him. 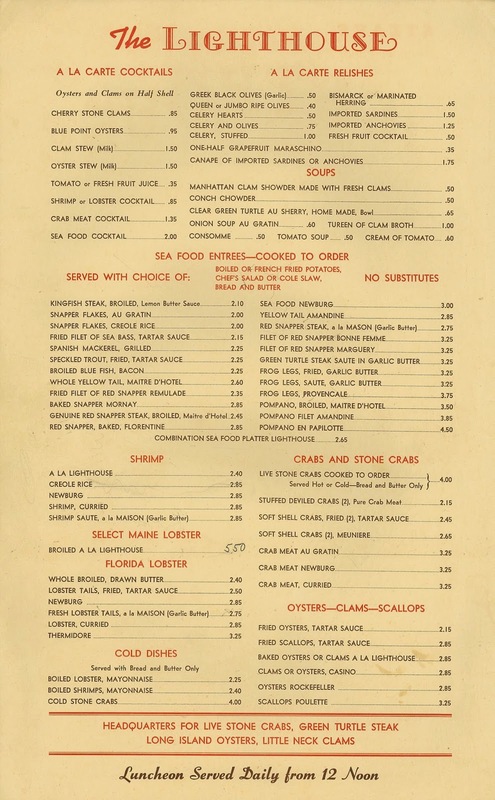 Are the restaurants any better in 1968 than they were fifty years ago, he wondered. “Dinner should be good tonight,” he said, putting his menu aside. Oh, there he goes again, Ginny thought, momentarily distracted from the appetizers she was perusing. His pretensions always missed the point. Just the idea of an average meal disheartened him, she knew, but could she give him what he really wanted; what every man wants—reassurance. No, she wouldn’t; she couldn’t. Anniversaries are really just points in time, she thought, marking the stages of a friendship. She looked up from her menu and smiled. Ginny had done the usual trick–been nice. Even the best marriages are frail things, she mused. People always find themselves slowly drifting apart. They no longer gave the dinner parties for six or eight that were so much fun, she mused as her eyes glided down the page, looking at this entrée, and then that. She and Len now threw large cocktail-and-buffet parties, paying off all their social obligations at once. Life in the suburbs was monotonous. Saturday night was steak night and the the Chinese place was nearby, but that was about it, unless you counted the country club—the dues were draining the budget. 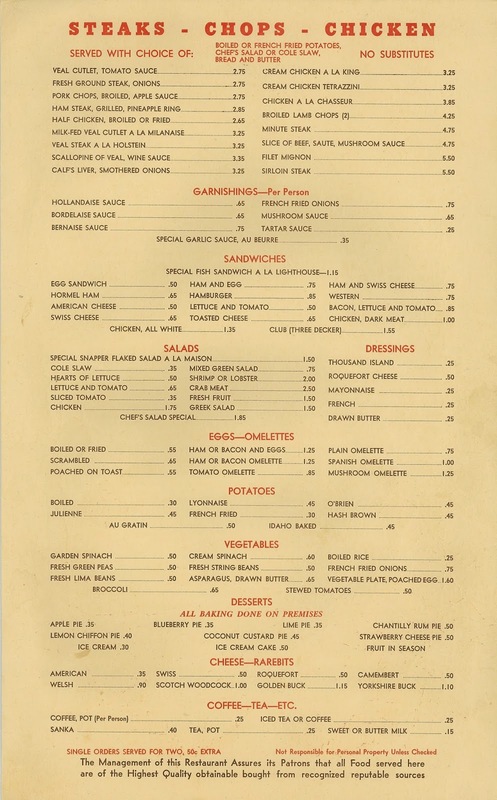 One could always go up to the Mai-Kai in Ft. Lauderdale, she thought, or drive over to one of the new Cuban spots in Riverside, not that they would ever go into Little Havana, as that neighborhood had just come to be called. The sun was setting when their drinks arrived. 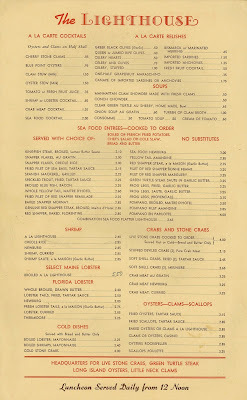 “I will start with the seafood cocktail, and then have the red snapper,” Ginny announced, as she put her reading glasses back in her purse and snapped it shut. She removed the paper umbrella from her whiskey sour and took a sip. The clouds were turning pink against the darkening wisteria sky. So this is marriage, she thought, a man and a woman looking at a menu, deciding what to eat. So that's why she . . . This is so funny, Henry! Showing your comic talent. Marvelous! Now how about doing a "Who's Afraid of Virginia Woolf?" version? Very excellent Henry! 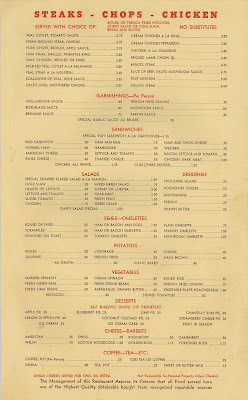 Given that drinks are mentioned in the narrative woven through your blog entry, might it be possible for you to post the drinks part of the 1968 menu? If if you have that part and would do so I'd be most grateful.